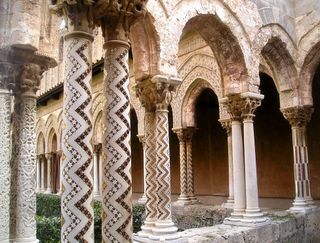 I've been to that cathedral in Monreale and failed to find out why all the columns in the cloister have different designs. We had a sketch assignment (I was studying abroad for Architecture school) and I chose to do a study on the pattern of column types and there seemed to be no rhyme or reason. Do you think the reason is because they were all taken from the ruins of other churches around Sicily or mainland Italy? Since you are over there, I figured you may know more about this than I.